President-elect Donald Trump selected Betsy DeVos as his Secretary of Education. DeVos is an establishment Republican who loves charter schools. Donald Trump has a dope new hat. Green Party presidential loser Jill Stein has raised millions for recount efforts in Wisconsin, Pennsylvania, and Michigan. Stein believes electronic voting could have swung the election away from Clinton, but there’s little evidence of that. Clinton’s camp will participate in the recount. For her efforts, she got torched by Trump on Twitter. Trump also claimed that he won the popular vote, alleging voter fraud in Virginia, New Hampshire, and California. Literally none of this is true. SHOCK NEWS: Courage, the turkey who got the annual presidential pardon in 2009, is DEAD. Donald Trump tweeted that Americans who burn the flag should lose their citizenship. Nancy Pelosi survived the House Minority Leader vote, but it was a doozy. Mitt Romney is (still) a candidate for Secretary of State. And look how happy he looks! Trump has made his picks for Secretary of Transportation, Secretary of the Treasury, and Secretary of Commerce. 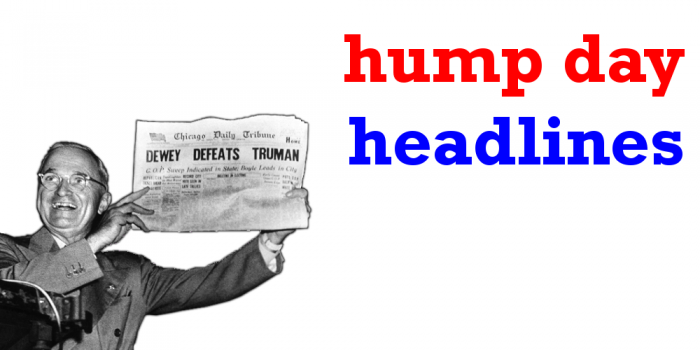 1 Comment on "Hump Day Headlines 11.30.16"